As you’ll know, these last few months have been pretty turbulent for me, what with sickness, a new job, and other life events. The result of all this change meant I hadn’t written anything in a year, which was probably partially to blame for my downturn. These last few weeks, though, I’ve focussed my energies on getting back on track with things. The first thing to do was to complete off the sequel to STELLA that had been sitting ‘almost’ ready. It needed some serious editing and polishing. Getting back to the page felt great though, and although it was purely to edit, a strange thing happened. I’ve read a lot of books these past 12 months, which can’t be a bad thing. But on picking up the manuscript for the book, I realised not just how much needed to be done, but how much standing away from a piece of work really helps. Where before I struggled to see the edits required, they were now standing out as if highlighted my a luminous marker pen. Surplus words and sentences, areas where to strengthen description and dialogue, punctuation, active v passive – it all got processed through my internal editor with vigour and a harshity I’ve never before admitted to myself. It’s a much stronger book now, and although I’m no professional editor, I think it’s a damn good go at an exciting story. And so it’s with a grey deal of pride and excitement that I am please to launch my new book, a novella – a sequel for Stella – and it’s available now: BACCARA BURNING. The last place exiled MI5 agent, Randolph Lowe, or Stella, once the world’s most wanted assassin, want to be seen, is back on British soil. Hiding out in Italy one year after their encounter with satanic demon, Ferris, Randolph and Stella are persuaded into travelling to Edinburgh in Scotland to solve a series of horrific and unexplained murders. And when news leaks that Ferris is back on the move and MI5 are closing in, Stella and Randolph begin to wonder if there are any moves left they can make. What will it take to rid Edinburgh of the evil of a 17th Century curse? Only Stella knows the answer. The Baccara burns brightest in Hell. Hopefully, if you buy it you’ll enjoy it. And if you’ve read STELLA it should make for a nice conclusion. 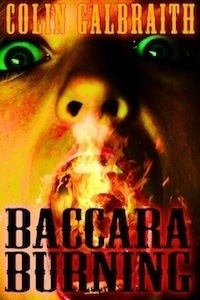 To read BACCARA BURNING you’ll need a Kindle. UK readers can purchase at THIS LINK. Non-UK readers can purchase at THIS LINK. Thriller author, music fan, St Mirren fan, fluff chucker, rabbit tamer, outstanding fake faller. Loves cannoli. This entry was posted in Books, eBooks, Fiction, Publishing and Marketing, Writing and tagged Books, eBooks, Fiction, Kindle, paranormal, published, Reading, Writing. Bookmark the permalink.